I see where you’re going with these rules. While I don’t really follow the whole limited release madness that consumes many a Beer Geek (I’m looking at you Philly Beer Peeps that stand in line for hours to get their annual helping of Pliny the Younger/Elder! ), there are a few seasonals/hard to finds that I would love to try, and since we live in Craft Beer Central, with a bit of creativity or simply reaching out to our friendly Philly Beer connections, I think we can get what we want in most cases. That being said, I really need to try some Three Floyds and more from Boulevard. I also want more from Cigar City. A couple years ago, Maine Beer Company would have been on the list for just about anything, but now that we can get them in NJ, the only beer of theirs that is on my list would be King Titus. The very next day, I took a ride to Wine Works in Marlton, NJ to buy a mixed six pack of “For Research Purposes Only” Craft Beer. 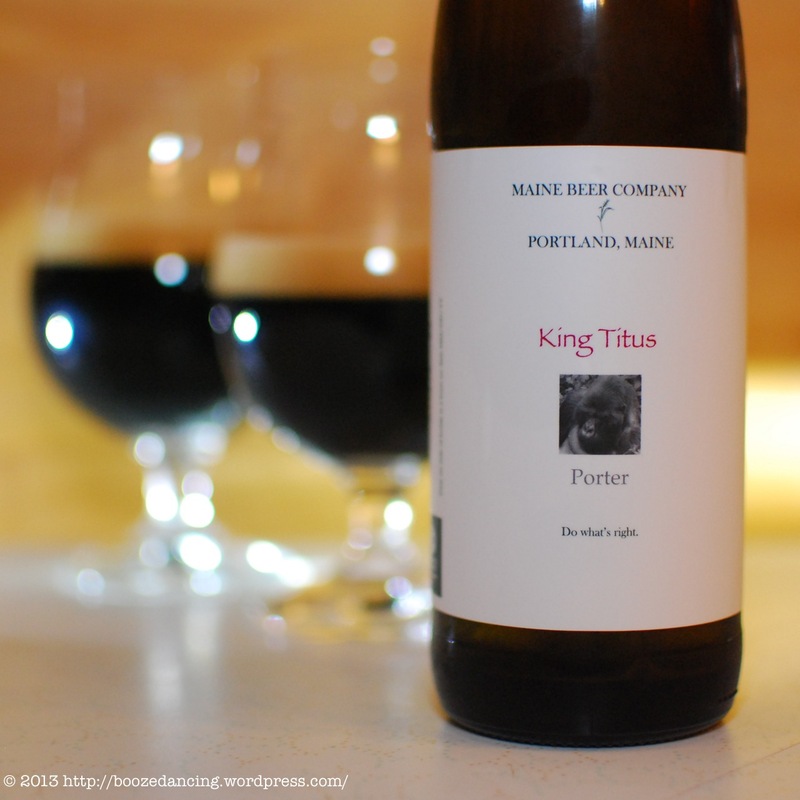 As luck would have it, they had several bottles of Maine Beer Company’s King Titus Porter on the shelves. I’m not sure if this would count as a serendipity moment, or whether I was just plain lucky, but since I was JUST talking about this beer, I couldn’t resist picking up a bottle. Our take on an American robust porter. Dark, thick, chewy, chocolaty, and of course, generously hopped. Appearance: Mahogany color with a thick, long lasting, mocha foam. Aroma: Citrus fruits, Baker’s chocolate cocoa, hops, hints of light roast coffee. Taste: Creamy, sweet, and chocolatey with a mild bitter finish.Right out of the fridge, the aromas and flavors are a little muted. As it warms up, it becomes much more vibrant and a little bit more bitter in the finish. Slight switch from roasted to burnt sweetness, like a well done marshmallow. Nice blend of flavors from front to back. Also very well balanced. A very nice Porter! Appearance: Mahogany color. Thick and creamy tan head that tops off at about an inch and dissipates slowly. Settles down to a thin layer of foam. Moderate lacing. Aroma: Rich chocolatey aroma with just a hint of espresso and a bit of piney hops off in the distance. Taste: Not overly carbonated with a smooth and creamy mouthfeel. Bittersweet chocolate at the onset. Some mild hop bitterness kicks in towards mid-palate. The flavors come together in the end and the aftertaste reminds me of a well done, dark chocolate cookie that’s burnt around the edges. King Titus is one seriously delicious beer! The taste is rich and flavorful, and it hides it’s alcohol content so well that you would never know that this beer clocks in at 7.5% ABV. This has a high drinkability factor and I may like this a tiny bit more than their Mean Old Tom. Once again, well done Maine Beer Company! Booze News Flash: A WhiskyCast Virtual Tasting, a Bit of Beertography, and a Blogging Birthday! Talk about timing – unfortunately, that serendipitous union of supply and personal demand, while achieving your goal of gaining that Holy Ale, violates one of my upcoming rules for a proper Quest. Serendipity/surprise appearances don’t coun’t. A quest requires dedicated, focused, maniacal effort. That said, I’m a huge fan of that King. Even if I didn’t vote for him I wouldn’t rant about having been oppressed – rather – I’m impressed. Seriously fine Porter. Rich, hearty, spectacularly balanced, flavorful and memorable. Another gem from these guys. Such a good beer that I violated one of my own rules several weeks ago and split a bottle of it at the PourHouse. Dedicated, focused, and maniacal effort never worked for me. I’m more of the keep plugging away and do what you do best kind of guy (not that I have any clue what that is). When I do that, things just fall into my lap. As you can tell from the review, I too shared this beer. Good G-LO was happy to share a fine beer with a friend. Bad G-LO is pissed because he could have easily drank it all on his own. I’ll definitely look for this one again!